When you move, you often have extra unwanted items that are more trouble to move than to leave behind. Many of these unwanted items may be needed by others – this includes food! 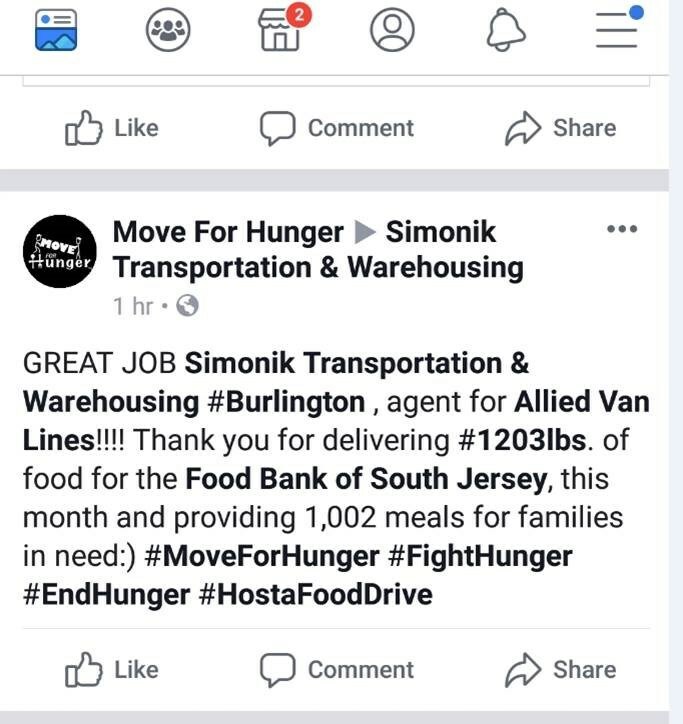 That’s why Simonik Transportation & Warehousing is a longstanding partner of Move For Hunger. Label and set aside a box for unwanted boxed, canned and jarred foods. Fill it up as you pack your pantry and cupboards – toss what you won’t eat into this box. Tell the movers to donate this box to Move For Hunger for you. Having worked with this charity for a number of years and having a large number of customers each year generated high volumes of donations. This past year, we delivered 1203 lbs of food – enough for 1,002 meals – to the Food Bank of South Jersey. Move For Hunger has thanked us for collecting these donations. But we would like to thank the organization for continually working to feed families in need. And we would like to thank you, our customers, for thinking about the needy during your busy local and long-distance moves – often donating extra non-perishables out of generosity.